Other than the Red Light District, Amsterdam is famous for its coffeeshops; but above all, it is important to note that these two things do NOT define the city as a whole. Amsterdam definitely has a LOT more to offer; what with its rich culture, heritage, and history—to name a few. » READ: Top 10 Things To Do in Amsterdam! However, it is not hard to admit that these two things add to the city’s charm that in turn, they become ‘wonders’ that are worthy to be witnessed when in this part of Europe. For this post, I will be sharing my experience in an Amsterdam coffeeshop as a first-timer, a newbie, a noob—whatever you call it. I hope that with this, I can help answer some questions that are floating inside your mind so you could get an idea about what it’s like, what you can do if you’re planning to try it, etc. etc. » What is a coffeeshop? At this point, you might be thinking, “Why is it called a coffeeshop when they don’t sell coffee?” Actually, they do—mainly cappuccinos or espressos and they might even serve teas, juices, soda, or no-drug snacks. But for the most part, they are called ‘coffeeshops’ because back when the policy of decriminalizing cannabis wasn’t so clear yet, this was the ‘cover name’ that was used by the shops who were selling hash and weed. When it was officially decriminalized in 1976, the name just stuck. So, simply put, if you ever want to go to a legit café then don’t go around asking for directions to the nearest ‘coffeeshop’. » Does this mean that cannabis is legal in Amsterdam or the Netherlands as a whole? This is actually a very complicated subject that if I try to explain it to you in detail, my post here will get veeeery lengthy. But I guess, to sum it up: NO. It’s technically still considered as an illegal thing, but not entirely punishable as long as you get it from licensed coffeeshop establishments (that are still under constant watch by the law). What does it take for these coffeeshops to NOT be on the wrong side of the law? Why did the Dutch government decriminalize cannabis? It’s because they believe that total prohibition of marijuana will cause more problems than it solves, and somehow, they are correct in this belief. Apparently, their drug policy did result to lesser pot smoking problems in their population especially since they can control and regulate it; according to statistics, they have fewer drug problems over the years and as compared to other countries in the world. 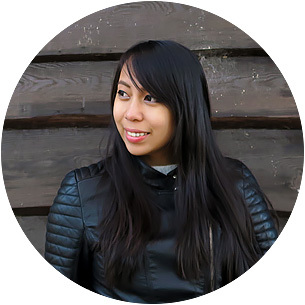 » Where then can I find a coffeeshop in Amsterdam? EVERYWHERE. There are a LOT of them and it’s easy to identify one because they have the word ‘coffeeshop’ on their sign. They also usually have Rasta colors and designs, or if they don’t have those elements, they should have a green and white flag / sticker on their window that says ‘Coffee Shop’ (thereby licensing them as one; see how it looks like here). TRIVIA: It is only in Amsterdam where they allow tourists to go inside coffeeshops. 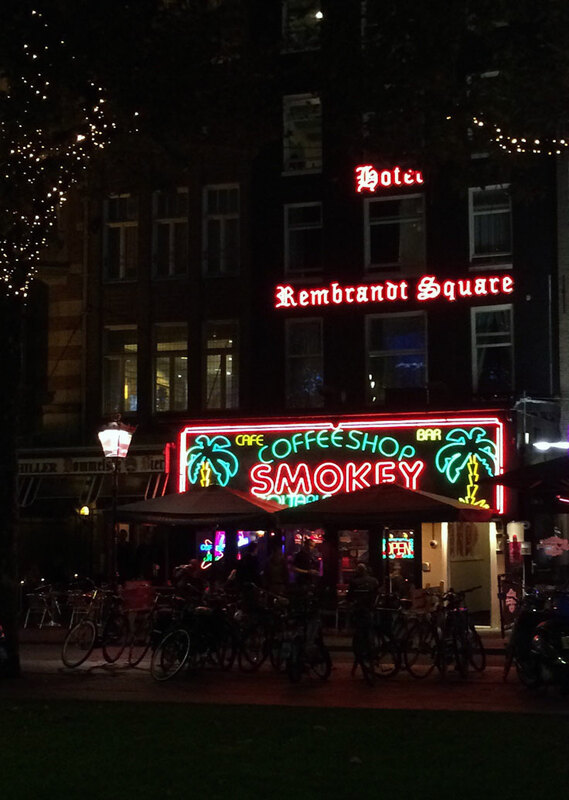 Apparently, the rest of the Netherlands’ coffeeshops require their customers to have Dutch residency—this was done in an aim of minimizing or stopping the ‘drug tourism’ throughout the country. What’s the best coffeeshop in Amsterdam? I did my research and one of the most popular coffeeshops in the city that had very great reviews was Abraxas. Other popular ones were named Baba, Barney’s, Dampkring, and Amnesia—we passed by all these coffeeshops while roaming around the city, but after taking a look at each shop, it was only Abraxas that really convinced us to go in because they had such a ‘chill’ ambiance going on. Plus, the crowd looked alright; later on, we even discovered that they even have such friendly staff! NOTE: I finally found out how weed smelled like when smoked! (The smell is naturally wafting out of these shops anyways). *By the way, it’s possible to get high from second-hand marijuana smoke if you keep hanging out or walking around these places; but don’t worry, if you’re going to take a drug test in the near future, it’s highly unlikely that you’ll fail just from having experienced second hand marijuana smoke. It’s certainly NOT health-alarming at all either. But actually, before I go on, I should be discussing first how I got here because that part was interesting. 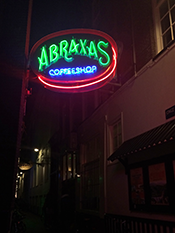 Abraxas has two locations in the city center and we went to the branch located at Jonge Roelenstraat. To go to this branch, you have to walk into a small alley which looked kind of creepy at first (especially since it was already nightfall when we decided to drop by) but once we stepped inside, we realized that there wasn’t really anything to be creeped out about. Because when we got a good look at the alley, there were ample surrounding shops manned by smiling people who were just minding their own business. I guess he gets this quite a lot… haha! TRIVIA: Not a lot of local Dutch people smoke weed nor do they frequent these coffeeshops. In all actuality, it’s mainly just tourists who flock these establishments. After the introductions, we were about to hand over our IDs when he went: “No need!” I guess… we looked old enough—LOL—because he asked for IDs from the group of people who were standing in line before us. (By the way, in other establishments like Baba, I noticed that they have a ‘bouncer’ sitting outside who asks for the IDs of people before letting them in). At this point I was very excited and a bit scared. I was all: AH SH*T! IT’S HERE. I’M FINALLY GOING TO TRY IT! But to cut the story (drama) short, Jonas and I only tried one brownie and it was enough for the both of us—it costs € 5.40 a piece. (The taste by the way is just like a brownie, but it was a bit dry and you will detect that distinct weird taste which came from the hash of course). Now this was my first time to get high so I don’t know if it was the maximum or minimum level, but whatever… I don’t care because after everything, I had fuuuuuuuuuuuuuuun! Mind you, the experience was like how I expected it to be! My senses were heightened (like a LOT). I felt and sensed everything around me in such an intense manner. My reaction time was in slow motion. It was insanely funny. I felt very relaxed and I talked about nonsensical things sometimes. Okay, maybe most of the time. The things or images that I see seem to be alive as if they’re almost 3D-like. Music sounded better and clearer. AWESUUUUUM. Eeverything—literally almost everything—was funny to me! I kept giggling a lot that night which Jonas made fun of me for the next day (I actually had the bigger half of the brownie so I don’t think he was as high as I was haha). I also felt a bit light-headed, as if I was drunk, but it was the better kind of being drunk. Food just tasted soooooo good (and I know that the fries in Amsterdam didn’t taste as good as Belgian fries). Simply put: it was amazing. And thankfully enough, the next morning, I didn’t have such a groggy feeling. Will I try it again? Probably not. I think for this kind of ‘fun’, once is enough. Too much of a good thing makes it lose its ‘magic’ right? And besides, I wouldn’t want to go down the stoner road. Haha! Obviously, I haven’t tried the ‘smoking pot’ thing (pipe, bong, joint, etc.) so I won’t be able to advise you on that one. But should you ever decide on opting for this kind, make sure to ask for assistance and instructions from the staff of the coffeeshop. They will be more than happy to assist you! So are you excited to try this out? Great! But hey, before you go, please look first at the tips that I’ll be listing below. They’re very important to know so you don’t overdo this coffeeshop experience! Go with a friend. It’s better to have someone with you especially if it’s going to be your first time. Besides, sharing the experience with someone you know and trust is a lot more fun than being high on your own. (Of course, make sure you’re both NOT minors, okay!) On second thought though, the best scenario is to have at least one friend who had tried it before (and knows how their body will respond to it) or who is not planning to try it out—so that you have one ‘sober’ friend to look over you guys. Don’t be shy! Feel free to ask, ask, ask! Every single one of these coffeeshops expect newbies to their establishments, and like I’ve already said: they’ll be more than happy to answer your questions so don’t be afraid to ask! It’s definitely ‘needed’ for you to do so, especially since most of the time, their menu will have very weird names on it like ‘White Widow’ and ‘Super Skunk’—which I won’t be able to advise you on because I have no idea what those are at all. LOL. So just ask, okay? If you’ve had an empty stomach beforehand – you could already start to feel ‘high’ after 30 minutes or an hour (but take note: it’s best to have a full stomach than an empty one when getting high). For my case, it took me 1/2 hours before I started to feel the change. (They said that the ‘high’ usually lasts for about 4 hours). And oh, if you’re planning on drinking alcohol after eating a space cake, do it with caution since it could possibly make you pass out—from happiness. LOL kidding aside, this is because it will be the first time you’re doing it and your body might not be able to handle it at all. If you consumed too much cannabis… don’t panic! It can be easily remedied by eating a solid meal, having some fresh air, or by taking a nap. (You’ll know when you had over-consumption when you start feeling dizzy, nausea and anxiety.) And don’t go roaming around the city if you start to feel queasy, stay in one place until you start to feel better. Nevertheless, it seems that coffeeshops encounter these problems almost all of the time and they know how to handle someone who is in such a situation; but hey… try to NOT be that person. There are already a lot of tourists in Amsterdam who make a fool of themselves, and it can be very embarrassing. It can be a funny story in the future, but the hassle it gives your friends or the shop-owner can get on your conscience. What is the difference between marijuana and hash? Not so much difference. We all know what marijuana is (also called as cannabis, weed, pot, dope, grass, ganja, etc.) so the only thing left to describe is hash. Hash is basically from the same plant, but it is concentrated, purified, and compressed. If marijuana is usually green and fluffy, hash is more brown and in blocks. There’s not much difference on the ‘high’ that it gives, but some say that hash is stronger because it has more THC (the main ingredient in cannabis that’s also used as an ingredient in medicines). Can I smoke marijuana outside the coffeeshops? Like in hotels, etc.? But can I buy weed from a different shop and then smoke it in another shop? Yes, you could. But as a common courtesy, at least try to buy something (like a drink) while you are using their establishment. It’s entirely up to you if you want to try a coffeeshop or not, but if you’re like me who just wants to experience it at least once before I die (again: bucket list!) then by all means, do so! There’s nothing embarrassing or wrong about it, especially since in this part of the world, it’s allowed and legal. Plus, you would even see normal people like you who are trying it out for fun (and for laughs!) so why not? Just keep safe, know your limits and you should be fine! Enjoy! What do you think of these coffeeshops in Amsterdam? Would you be willing to try it out when you visit this city? Or have you tried it before? How was it for you? I loved reading this! I definitely appreciate your story. I'm visiting the Dam for the first time soon and am trying to prepare myself. I'm an experienced smoker but honestly I have no idea what to expect when smoking legally hahaa. I love Amsterdam! When I went last year I went to The Bulldog Cafe with some friends! We had a great time! Thanks for this lovely post! Can you buy a space food and bring it with you to your trip? like going out of amsterdam into brussels? Thank you for the response. Example i will buy a brownie can i bring it with me? What I can say for sure is that you can bring it around with you within Amsterdam. Once you're outside of it, I'm not sure you can as you can get arrested for it. Again, it's best to ask the vendors once you buy the brownie. Sorry if I can't be of much help. I love that you documented your first weed experience!! And in such detail....this is great! We had a super fun time in the coffeeshops and ended up with some priceless stories. And my Dad was with us, so it is something that we will laugh about forever! But seriously, great post! Haha! I thought that it would be a nice thing to share here on the blog ;) also to help others to be well-guided about it. Anyhow, I'm glad you had a fun time trying it out too! The experience can be really interesting indeed! Great tips and photos. I would love to visit Amsterdam too. Looks like my tummy will be happy after visiting these coffee shops. Read this from start to finish and at the end I want to visit Amsterdam and try out these coffeeshops. So cool and I want to experience the same feeling. Hahahahaha... I could be weird but come on everyone wants to try out something new right? Whoa! I didn't know that it's legal in Amsterdam. Curious over the space food, how was it?